Children should have comprehensive and specialty dental care. 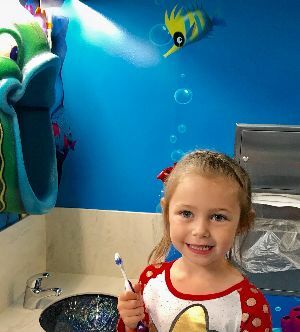 If you are self paid or have insurance with deductible,co-pays, and/or frequency limitations, we have options in place to help you finance your child's dental care. For your convenience we accept cash, checks, Visa and MasterCard, as well as CareCredit. Our staff is always available to help you with your dental plan and assist you as you decide on financing options. Just call! Please understand that no insurance pays 100% of all procedures. Dental insurance is meant to be an aid in receiving dental care for your child. Many parents believe their insurance pays 90% or 100% of all dental fees. This is not true! Most plans only pay 50% to 80% of the average total fee. Some pay more, some less. Benefits are not determined by our office. The percentage paid is usually determined by the type of contract your employer has set up with the insurance company or how much you or your employer has paid for coverage. We can't guarantee what your insurance will cover. It is very important that you help us by keeping us informed of any insurance changes such as policy name, insurance company , address , or change of employment. Remember, no insurance pays 100%! You are responsible for any balance in your account after 30 days, whether the insurance paid or not. We will be glad to send a refund to you once the insurance has paid us.